The Nissan Kicks is available in 6 variants and 11 colour options. Checkout Nissan Kicks price, specifications, colours, mileage, features and reviews. Our detailed Nissan Kicks comparison helps you compare the SUV with its competitors. DriveStreak brings you all the information about Nissan Kicks to help you make the right buying decision. Nissan Kicks is a premium SUV from the Japanese car maker. The Kicks SUV is based on the Nissan Terrano platform and is different from the one sold in international markets. The Nissan Kicks is available with both petrol and diesel engine options. 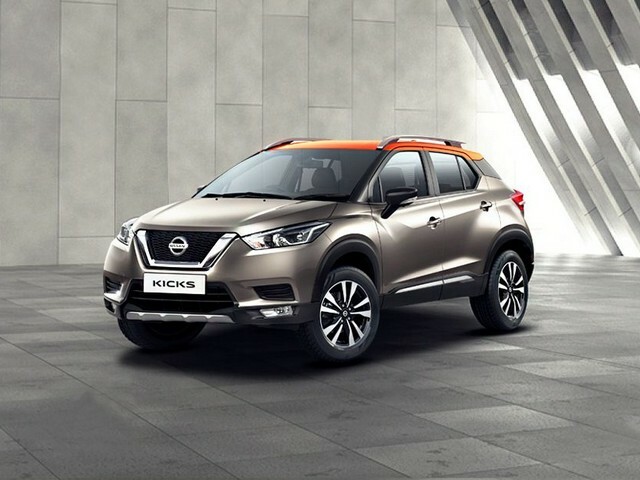 Nissan has finally launched the Kicks SUV in India on January 22. It is priced between Rs 9.55 lakh to Rs 14.65 lakhs (ex-showroom, Delhi). Nissan Kicks is offered with both petrol and diesel engines. The petrol engine is a 1.5 litre unit which develops 106 PS of power @5600 RPM and 142 Nm of twisting force @4000 RPM. The oil burner generates 110 PS of power and @3850 RPM and 240 Nm of torque @1750 RPM. The petrol motor is mated to a 5-speed MT while the diesel engine is paired to a 6-speed MT. The petrol manual delivers a mileage of 14.23 km/l. The diesel manual returns a mileage of 20.45 km/l. On the safety front the Nissan Kicks is equipped ABS (anti-lock braking system) and EBD (electronic brake force distribution). It also gets Vehicle Dynamic Control and Traction Control technology to help you stay in control at all times.